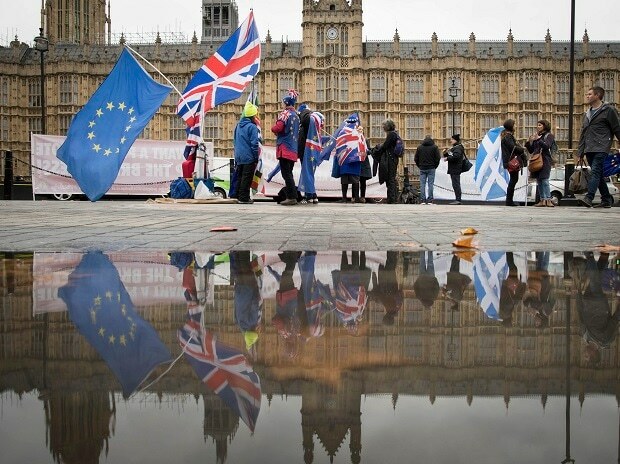 The elaborate and time-consuming way British lawmakers make decisions in parliament has been thrust to the fore by Brexit, with the outcome of a series of votes next week set to determine how and when the country leaves the European Union. Over three days, more than 600 lawmakers must decide whether to accept Prime Minister Theresa May's deal to leave the EU, leave without a deal, or delay Brexit altogether. The voting process could take hours, and most of the drama takes place out of sight of television cameras. Critics say it is an outdated waste of time, others argue it offers a rare chance to lobby senior ministers. So, what actually happens behind the scenes, and why does it take so long? The process begins with an ear-splitting cry of "Division!" - the parliamentary word for a vote. This sets bells ringing around parliament - and in some neighbouring pubs and restaurants - to alert lawmakers they need to get to the chamber, quickly. Members of Parliament (MPs) have eight minutes to rush from their offices, meals and meetings. To help them, escalators change direction, doors are propped open, and parliamentary staff know to keep well back and dodge the stampede. Once MPs reach the debating chamber they have to decide which way to vote and then walk through the right door. Party whips - an 18th century term derived from hunting outriders who keep stray hounds on track - are there to guide, cajole and sometimes threaten MPs into voting the right way. When the eight minutes are up, the speaker instructs staff to "Lock the doors! ", and latecomers are turned away. The voting rooms are known as division lobbies and form two C-shaped corridors wrapping around the outside of the debating chamber. The "Ayes" lobby entrance is behind the speaker's chair, the "Noes" lobby is at the opposite end of the chamber. Both are almost identical, and anecdotes occasionally surface of confused MPs ending up in the wrong lobby. About 5 metres wide and 30 metres long, the walls are lined with a mix of bound copies of decades-old parliamentary transcripts and banal housekeeping notices detailing vote results and schedules for the day. With hundreds of lawmakers voting, the lobbies fill up quickly and a long shuffling queue forms. Votes are recorded at the end of the corridor, when lawmakers filter past one of three desks, organised according to the first letter of their surname. Manning each desk is a clerk with an iPad, trained to recognise every MPs face in a split second and tick off the right name as they shuffle past. Behind them, two lawmakers designated as "tellers" man the double-door exit, keeping the doorway deliberately half closed to ensure lawmakers exit in single file. They perform their own headcount to crosscheck against the clerks' record. The results are compiled and both pairs of tellers return to the chamber to announce them publicly. Those in favour of the voting process say the division lobbies are a rare chance to catch senior ministers unaccompanied by aides. "For voters, they should welcome the fact we still vote in the traditional way because it means that ministers, up to and including the prime minister, have to come to vote," said Mark Harper, a Conservative lawmaker and former Chief Whip. "You could be talking to the transport minister about getting a new road or a bypass, or a new rail link, something like that." Critics say the process is uncomfortable, takes too long and needs reform. They argue that the benefit of access to ministers doesn't apply to opposition parties who rarely find themselves voting alongside the government. "I hate it, I really do ... it gets in the way of how we do our business and just wastes time" said Scottish National Party lawmaker Pete Wishart. He describes a colleague who suffers from anxiety attacks finding the crush a serious health hazard. "It's uncomfortable, you're bumping into everybody, everybody's just wanting to be elsewhere."